Diabetes is a very common illness which is rapidly increasing in incidence. It is estimated that 1 in 4 people will become diabetic.The most important risk factors for developing diabetes are a family history of the illness, being overweight and having a sedentary lifestyle. Diabetes is associated with many potential complications, particularly damage to blood vessels. These complications include heart disease, blocked arteries to the legs or brain and stroke when large arteries are affected ( "macro vascular" complications) and eye damage and vision loss, kidney damage and nerve damage when small arteries are affected ( "microvascular" complications). A recent study in Adelaide showed that more than 50% of people with diabetes have some macro-vascular complications and 66% have microvascular complications! The IMPORTANT NEWS is that by maintaining very good control of their diabetes, patients can GREATLY reduce the development of these complications. If patients achieve very good control ( HbA1C less than 7%) it has been shown that complications can be delayed by many years, compared with patients with lesser degrees of diabetes control. Very good control of blood pressure has been shown to be equally important as "sugar" control in preventing diabetes complications. This knowledge is the basis of the very successful St Agnes Diabetes Clinic - the first general practice diabetes "mini-clinic" to be established in Australia. The Diabetes Clinic includes a team approach to systematic and structured care - the team including some of our GPs and practice nurses, a dietitian, diabetes nurse educator and podiatrist. The team is supported by various specialists as necessary - particularly for regular eye checks. Achieving these goals, which are based on national guidelines, has been shown to greatly reduce the development of diabetes complications. If you feel that you are eligible for an exemption from these new changes please CLICK HERE and download the application form and discuss it with your GP. 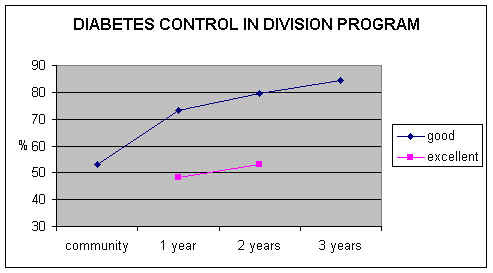 Our program has proved particularly effective - this is illustrated in the graph below, which shows that for diabetes patients in our community not attending a diabetes clinic, 53 % have "good" diabetes control with a HbA1C of 8 % or less. By the time patients have spent 3 years attending the diabetes clinic 84 % have "good" control - this means a marked reduction in, or delay in development of complications for a lot of people! There is a wealth of information and resources on the Diabetes SA website, including information promoting prevention, early diagnosis and best management for patients, their families, health workers and doctors. There are many fact sheets which can be downloaded. Go check it out!